Shotgun patterns are measured at 40 yards for all gauges, except .410 bore. .410’s are patterned at 30 yards. Patterning is a simple process, but time consuming due to all the counting required. Here is the correct way to pattern a shotgun. Shoot at the center of the paper. Draw a 30″ diameter circle around the center of the resulting pattern, so that it encloses the greatest number of holes. That is it; you have now officially patterned your shotgun. 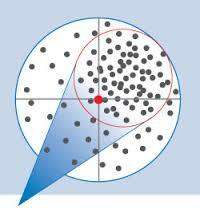 Of course, every shot varies, so ideally you should repeat the process 10 times and average the results. (Analogous to shooting a group with a rifle, rather than just one shot.) Your shotgun’s pattern percentage will vary if you change the shot size, the amount of shot in the shell or the hardness of the shot, so you need to pattern all the loads you actually shoot in a given gun. Pattern percentages will usually (but not always!) go up if you increase the hardness of the shot, decrease the weight of the shot charge, buffer the shot inside the shell, or decrease the muzzle velocity of the shot charge. Pattern percentages will typically do down if you use softer shot, increase the weight of the shot charge or increase the muzzle velocity of the load. These generalizations primarily apply to traditional lead shot, your gun may vary.